Blog — Onetime Supply Co.
A loose catalogue of archived information, projects, updates, events, and new releases. 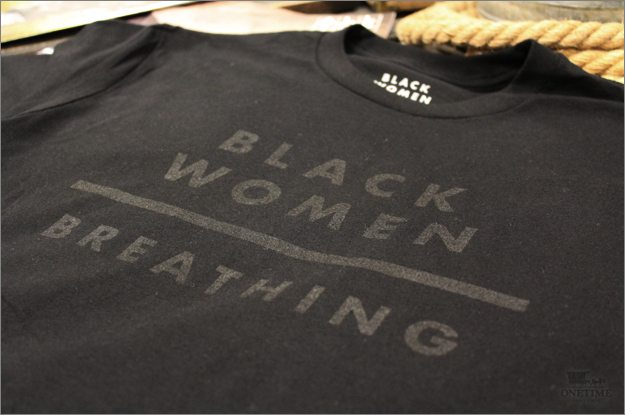 "Black Women Over Breathing is a very simple concept: Black Women are important." This movement was made popular by Adrian O. Walker -- a photographer and artist from North St. Louis (currently residing in Oakland, California) whose made quite the name for himself. Adrian has been a part of multiple exhibitions with Scholastic Chess Center (in CWE) and has most recently helmed and curated the self titled Black Women Over Breathing exhibition in the Urban Arts Center in the heart of Old North St. Louis. 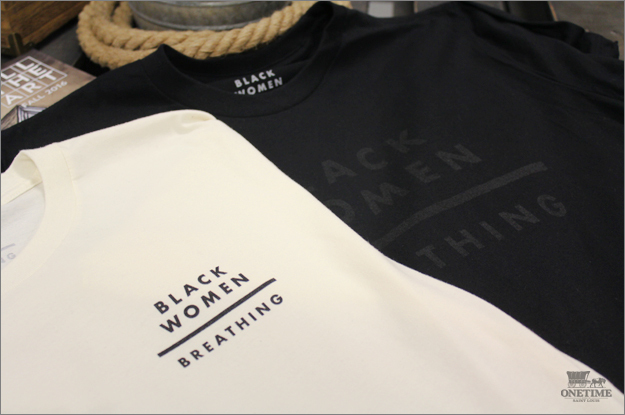 Over the past few months, Adrian has commissioned me to print the Black Women Over Breathing design in multiple styles and colors to help push the movement forward. 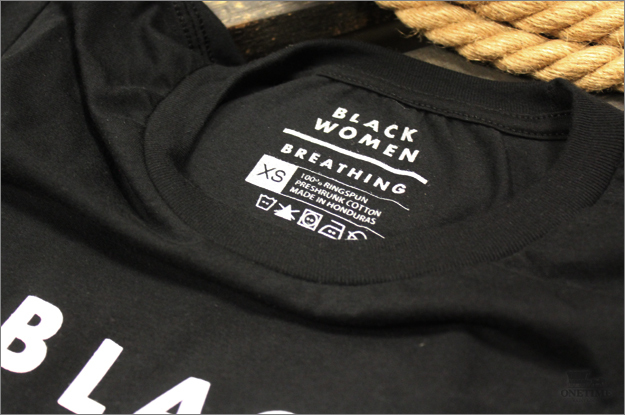 We've played with a wide range of different textures from shiny black ink on a white garment to matte black ink on a black garment. We're constantly working together to choose the next garment styles for retail on his website. This project was prompted by Fontbonne's Campus Ministry and Service Diversity & Social Justice program directors for their 2017 Gulu Immersion project. The project's mission is to provide students an educational experience with an opportunity to put them into the world to learn more deeply the values of justice, solidarity, simplicity, self-identity, and vocation. The image itself was custom calligraphy drawn by [ig: @clairegcalligraphy], which turned out to be a single color front and a single color back print order. 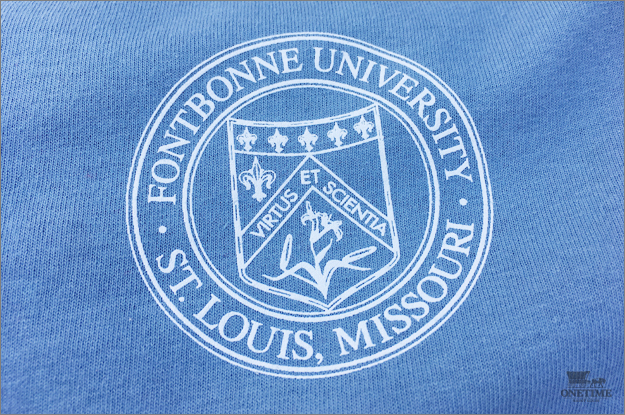 Initially, I was worried about how much detail was going to come out of the small print of the Fontbonne logo on front but it turned out great. The "Columbia blue" shirt color was a great choice; it compliments the design very well. The crew over at Hope Dealer Ministries is easily one of my most loyal and faithful clients (no disrespect to anyone). Repetition wise, I've probably printed more for them than I have for myself (and probably) including product for Onetime Supply Co. 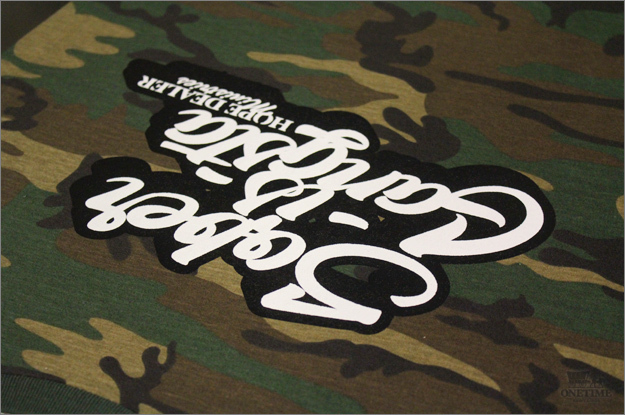 The design here: Sober is Gangsta is one of their most popular designs. We've redesigned and printed it time and time again--and this time is no different. 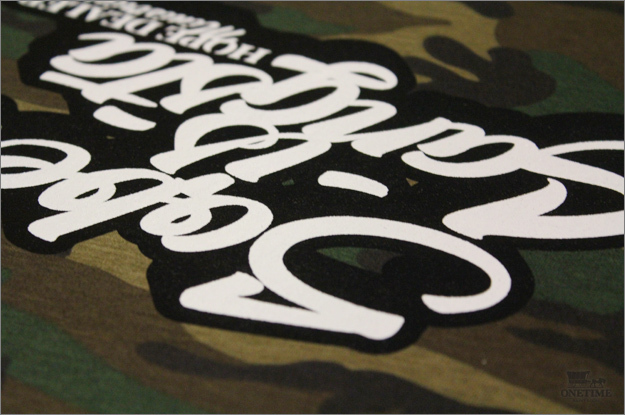 The unique thing about this project is that it was printed on camouflage textile and to most people that wouldnt mean much. Without getting into too much printer 'mumbo jumbo' lets just say us printers know how difficult it could be. The problems occur typically during the drying process (if it gets too hot) the dye in the shirt will begin to seep into the printed ink and discolor it. This is called "dye migration". For this project, what I did was printed with special inks that blocks much of the migration and dried the shirts for a shorter period of time. Again, it's all technique but the shirts came out great! I love the little splash of orange that we put in there, it really makes the design pop. 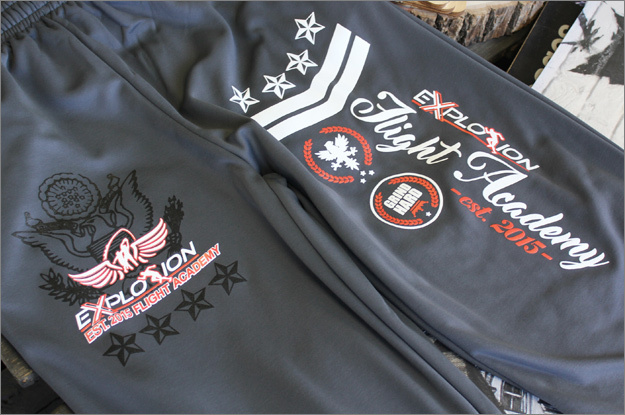 This was another large order round for the youth football club, Explosion Flight Academy. 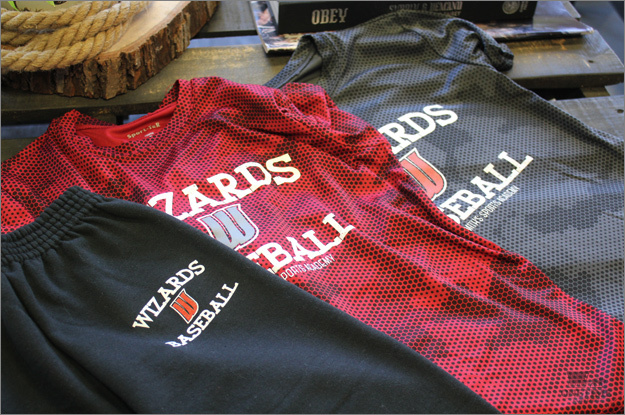 Similar to last year many of the printed images had to be re-illustrated to get the proper look for the printed garments. 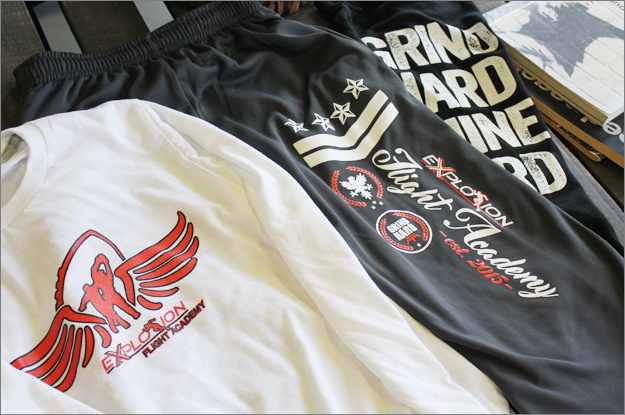 Most of the printing was done on 100% polyester or straight out spandex blend garments. Except this year we printed full area down the pant leg of sweatpants--2colors on one leg, and 3colors on the other leg. Pulled a few all-nighters to get the order complete but, as usual they came out looking great. My client shared with me a design she wanted printed on koozies. I was able to render it and print them on a plethora of different color koozies for her within a strict window due to a deadline. She told me that they were to be going out of the country to a small intimate area in Akumal, Mexico for her friend's wedding. We were both pleased with the detail that I was able to get out of the small image and on to the koozies. 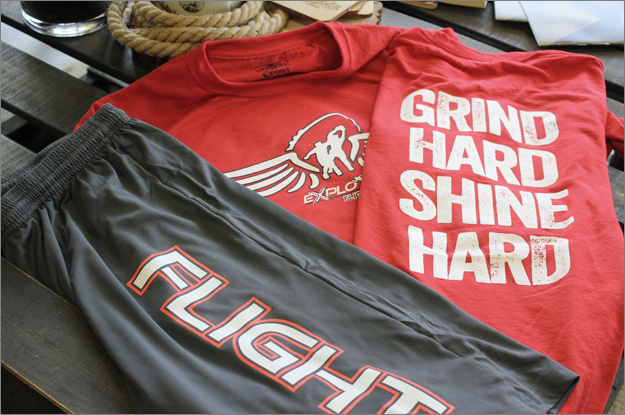 This was a single color front single color front print done as a personal order with custom mixed coral color ink. Similar to the projects done for Bayless (High/Jr. 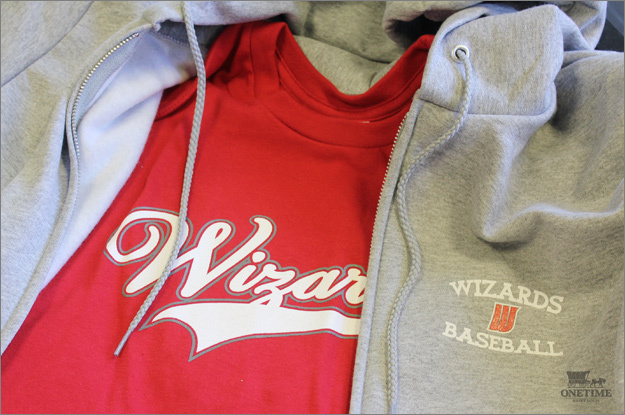 School) Bands--I was tasked with creating a catalogue with an array of designs for the Ozzie Smith's Sport's Association: Baseball team--the Wizards. On top of putting the designs together a separate online pages was carved out and created for patrons of the teams to order from. This catalogue featured designs for adults, women, and youth individually. This was a fun project to work on being that it was my first fully functioning online catalogue. We were able to collect the orders online, list them, print them, and get them to the respective individuals once they were/are completed. I've gotten noting but positive responses from the the inner workings of this method being that as issues arise, the problems are solved quite promptly.